Friday 29th May saw the opening of a fantastic community facility in Moston, North Manchester, courtesy of everyone connected with Community Football Club, FC United of Manchester. 4,232 passionate football supporters headed to Broadhurst Park to watch non-league FC United take on the mighty Benfica in the first ever football match at the ground. BBC1 Breakfast broadcast live from Moston on Friday and many more national press representatives descended on Moston throughout the day. 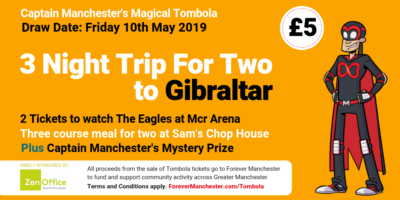 This is one of many exciting things happening in the local area and we’d like to share some of the things Forever Manchester will be involved with over the next few months and years. We recently announced a £200,000 community investment into Moston and Harpurhey, and we have been in discussions with FC United and other local agencies active in the area as to how we can work together with local residents to make a lasting impact in the area. Our aim is to help connect local people, groups and agencies and encourage them to share their skills, talents and resources to help make the communities within Moston and Harpurhey thrive. 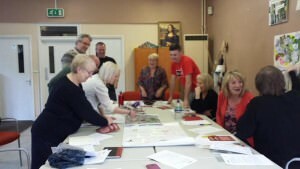 Already we have brought together a group of residents and representatives from local community projects,to discuss how we can begin to build a community plan for the area. Some of these people have never met each other before and from the first meeting, phone numbers have been exchanged and connections have made. The community investment programme, known as Fourteen, is still very much in its embryonic stages and the next step is to start meeting local people to find out what they want to see and do. Over the last few months Helen and the team have been out and about meeting people in the local shops and the surrounding areas where we’ve been explaining more about what we’re doing and how they can get involved. To assist our work in the local area we are now recruiting for an additional part-time Community Builder to work for Moston and Harpurhey. The closing date for applications is Wednesday 17th June. This FREE EVENT is designed to bring the community together to take part in Sport and Physical Activity. The day will involve taster sessions and competition in a wide range of sports including rugby, football, disability sports, athletics, boxing, run, skateboarding, volleyball, badminton, basketball, netball and the fun does not stop there!…there will also be a bouncy castle, free running, arts and crafts, face painting, fun family games and much much more! The event also aims to develop local community clubs and encourage them to get involved in the Manchester Games. The Forever Manchester team will be there to give local people the opportunity to find out more about us and our work in the area as well as providing us with the opportunity to find out what ideas they have to help make the area thrive.